Kolar Gold Fields - NOSTALGIA: KGF CLUB - The First Club established in Kolar Gold Fields and the fourth oldest golf club in India. KGF CLUB - The First Club established in Kolar Gold Fields and the fourth oldest golf club in India. 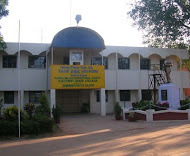 In 1885, the British Mining Company of John Taylor and Sons established the first club in Kolar Gold Fields and named it the KGF Gymkhana Club. Bridget Kumar charts the history of the club. Among its members was T P Kailasam, one of the greatest Kannada playwrights. 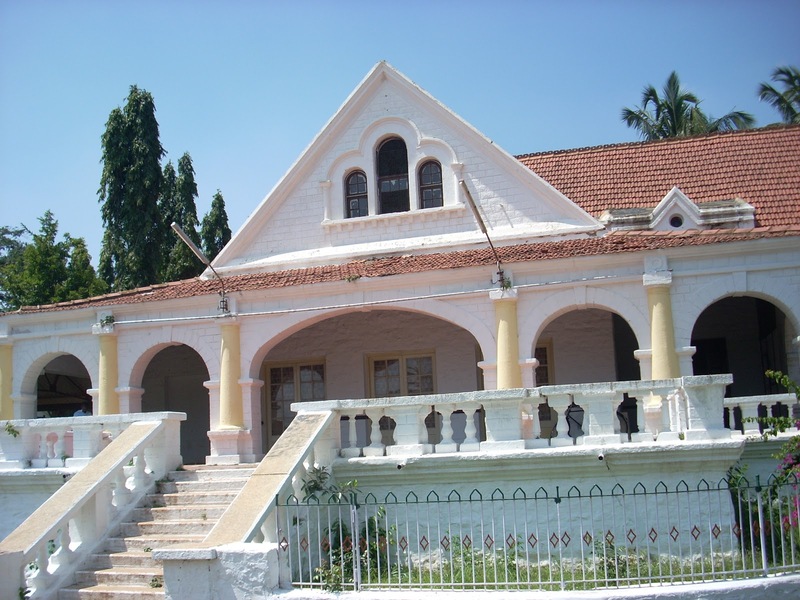 By the end of the 19th century, a sprawling British township was in place in Kolar Gold Fields and it came to be known as ‘Little England’ due to its British and Anglo-Indian population and its colonial ambience. 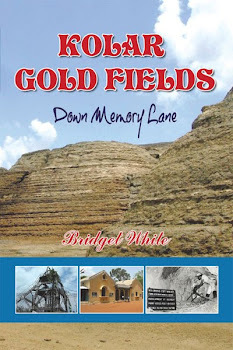 Being a British mining colony, the social life of people at KGF was greatly influenced by British culture. 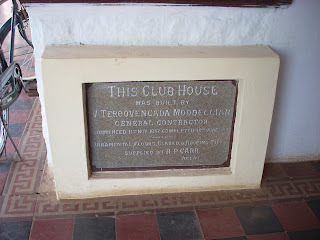 The region saw the establishment of quite a few Associations towards the middle of the 1800s, such as the Kolar Gold Fields Choral and Dramatic Society which organised plays and choral functions, The Royal Army Temperance Association, The Trades list, etc. These Institutes catered to the social and cultural needs of the local British and European population. However, the need for recreational and sports facilities and clubs was greatly felt. In 1885, the British Mining Company of John Taylor and Sons established the first club in Kolar Gold Fields and named it the KGF Gymkhana Club. They built a 12-hole golf course and a beautiful Victorian Club House. This club was the first of its kind to be established in KGF and is ranked as the fourth oldest golf club in India. It had its own polo, golf and hockey teams. The club was and still is affiliated to Indian Golf Union and is also affiliated to all the major clubs in India. The club house was equipped with a traditional bar, library, snooker and billiard rooms, tennis courts, shuttle badminton courts and a ballroom with a wooden floor – all built and completed in a period of just six months since the company had vast man power and resources to complete the project in record time. 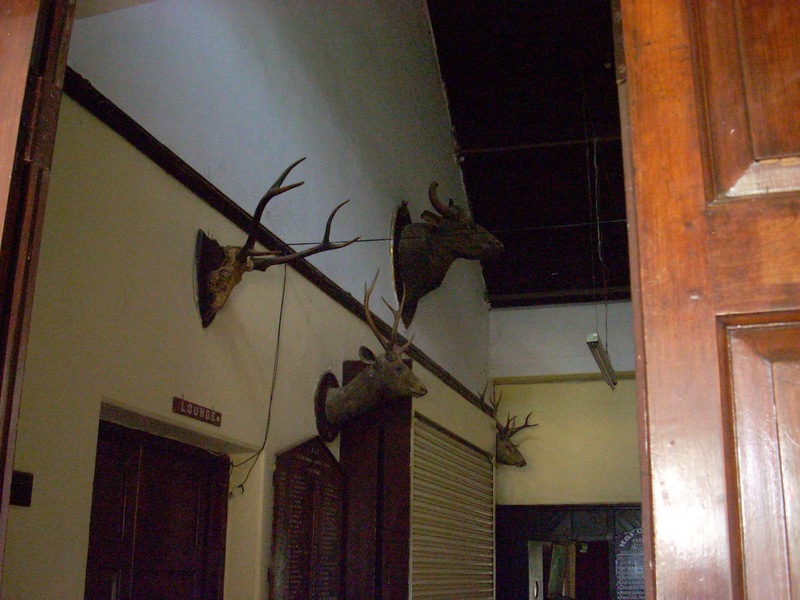 The foyer of the club was decorated with many deer and bison heads on its walls, as mementos of hunting spoils by the members. The club was surrounded by a beautiful garden with well-maintained sprawling lawns and flower beds. The serene surroundings of the club, with the golf course on the side looked like a picture from the English countryside. Because of the hilly terrain of KGF, the 12-hole golf course was located in a winding picturesque landscape with bungalows and villas along its course. Unlike other golf courses which have putting greens, the KGF Golf Club had no putting greens. Instead it had ‘browns’ constructed of river sand in place of greens. The golf course had a number of natural canals cutting across the fairways lined by huge trees planted when the club was established and gave it the setting of a British country side. The KGF Club House has a regal colonial ambience. 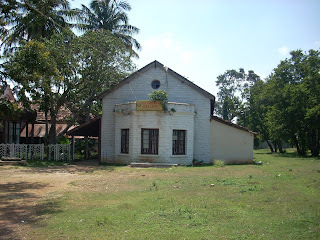 The old club house that is now more than a century old, was built of stone quarried from the area itself, with beautiful teak wood doors and windows. 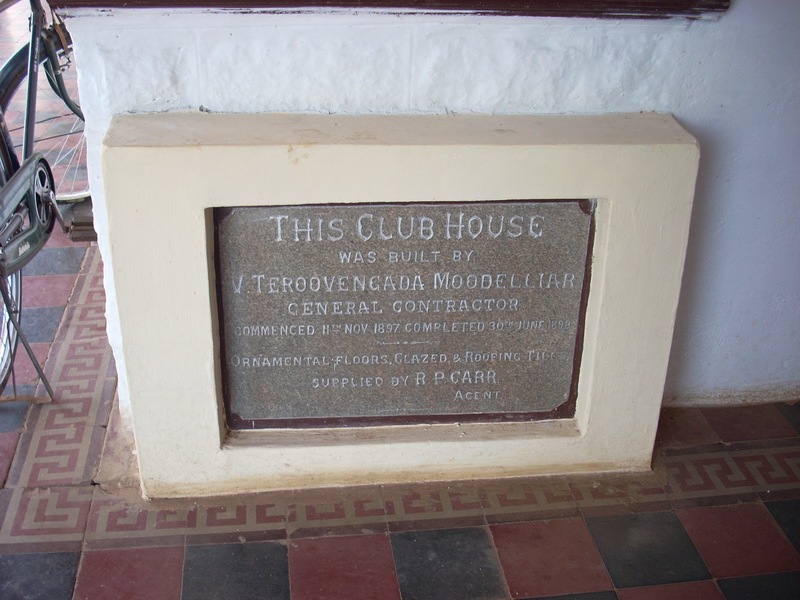 It also had a teak wood floor and the floor was always polished.The door handles, hinges and knobs and other fittings for the Club House were brought specially from England by the John Taylor and Sons Company, when the club was constructed. The solid brass door handles and hinges shone like gold all the time with constant polishing. The sterling silver cutlery and the beautiful crockery with the club’s emblem were also specially ordered and brought from Sheffield in the UK. The KGF Club also had the distinction of having an exclusive ‘ladies bar’ just off the main lounge, where the ladies enjoyed their pims and sodas, gin and lime or vodka and orange juice, whiskey and soda, etc while catching up with the latest news and exchanging gossip. The ladies lounge also had a huge grand piano and the ladies invariably gathered around it singing all the old songs and ballads while one of them played the piano. The gentlemen had their own bar to enjoy their evening drinks, and the ladies were strictly prohibited from entering it. The KGF Club was famous for its English and colonial food in the old days. Mulligatawny soup, roast lamb with steamed vegetables, mashed potatoes, club sandwiches, cucumber sandwiches and caramel pudding were the main items on its menu. In those early days, getting membership in the KGF Gymkhana Club was practically impossible if one was not British or European and was totally out of bounds for Indians. Only the British and European officers could become members. Even Anglo-Indian officers of the Company were refused membership to the KGF Club. However, in the 1930s, an exception was made in the case of a young Indian, a Tamil geologist who returned to Kolar Gold Fields after his studies in Ireland. His name was T P Kailasam (one of Kannada literature’s greatest playwrights), the son of one of the old timers in KGF. He charmed the British with his wit and impromptu singing and ball room dancing that he picked up in Ireland. It was only because he was a “foreign returned” Indian who according to the British, knew his manners and etiquette, that he was given the ‘honour’ of becoming a member of the Club. No other Indian was allowed these liberties in the club. However, in the 1940s, things began to change and the management realised that they had to change the rules to some extent. They made an exception that only Indian covenanted officers would be allowed membership of KGF Club. This trend continued even after the mines were nationalised and the British left KGF. 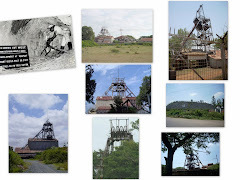 Over the years with most of the old members retiring from the mines and the eventual closure of the mines a few years ago, the KGF Club now allows membership to persons from outside KGF as well.